Enzyme based odour eliminator. It’s designed to combat bad odours by eliminating the root of the problem. 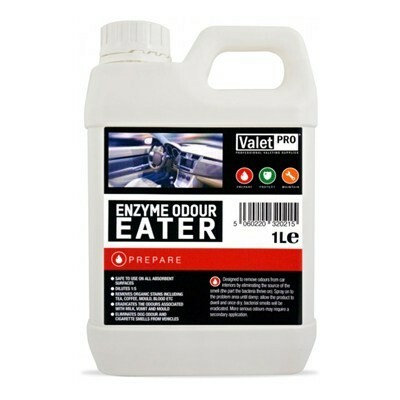 Enzyme Odour Eater is our enzyme based odour eliminator. It’s designed to combat bad odours by eliminating the root of the problem. Bacterias thrive on these odours as a food source which could be anything from milk to urine or drink stains and this product eliminates that food source, ensuring there is nothing left for the bad bacteria to thrive on. Our 500ml trigger bottles are already diluted and ready to use, whilst our 1L and 5L bottles can be diluted up to 1:5. "Enzyme Odour Eater is simply brilliant and as a man with two children and a dog I can tell you it’s a life saver. Enzyme Odour Eater removes dog smells from our family vehicle, as well as the spills and stains that come along with two young children. I couldn’t have cream carpets without it!"